Luxury SUVs can be difficult to find. Not that there aren’t many out there, but wading through all of them and trying to find the one that fits you can be difficult. 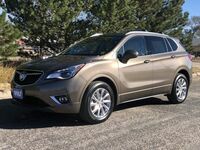 Thankfully, there is an easy answer to the dilemma of trying to find the right luxury SUV; the 2019 Buick Envision, which we have now researched here in Ogallala, NE. This vehicle offers comfort, space, and technology many look for in luxury vehicles. Now, you’ll have 5 different trims to look at; 1SV, Preferred, Essence, Premium, and Premium II. If you want FWD, then you’ll need to look at 1SV, Preferred, or Essence. If you want all-wheel drive, then take a look at Preferred, Essence, Premium, and Premium II. There are 2 engine options for the Envision; 2.5L 4-cyl engine, which will get 197 horsepower and 192 lb.-ft. of torque. The other option is the 2.0L Turbo 4cyl engine which has 252 hp and 295 lb.-ft. of torque. Now, let’s take a look at what you can expect to see when it comes to standard and available features for the Envision. There are many, so we’ll only take a look at a few. Of course, you can always contact us here at Wolf Auto Center if you want the full list of specs and features. 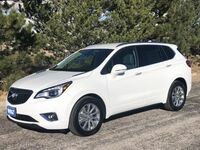 As we’ve said, there are many standard and available features for the 2019 Buick Envision. These features include things like Rear Park Assist, Rear Vision Camera, Lane Change Alert with Side Blind Zone Alert, and Rear Cross Traffic Alert, depending on what trim you get. Other technologies include things like the Bose® premium audio system that is standard in the Premium II, which also has the Automatic Parking Assist standard as well. Don’t forget about the Active Noise Cancellation, which is standard on all of the Envision trims. If you continuously find yourself needing an extra hand when loading the vehicle with groceries or gear, now you don’t need to. Check out the Hands-Free Power Liftgate that is standard on all of the Envision trims. If you have any questions about this exciting SUV vehicle, please don’t hesitate to contact us here at Wolf Auto Center. We are always happy to tell you more about the specs and features that this, or any other Buick model, has to offer its future driver. Interested in a Buick Envision?